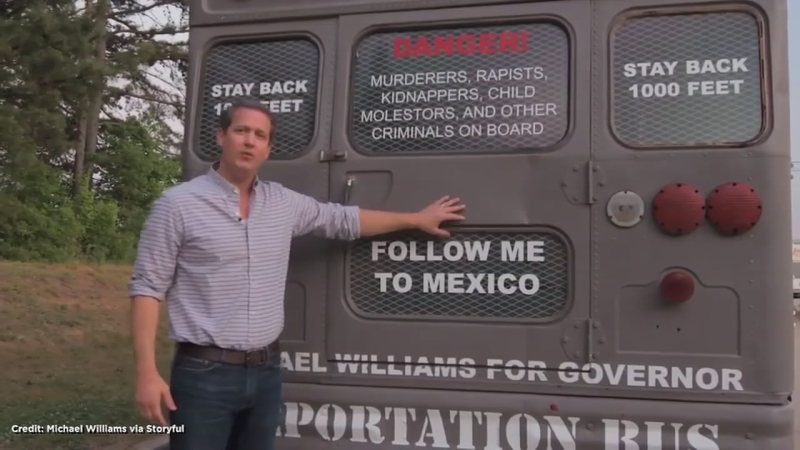 GEORGIA -- Republican candidate for Georgia governor Michael Williams revealed a "deportation bus" as part of his campaign, in a video posted on Facebook on May 15. The back of the bus says "Danger! Murderers, rapists, kidnappers, child molesters, and other criminals on board," and "Follow me to Mexico." The side of the bus reads "Fill this bus with illegals." In the video post, Williams wrote that he plans to visit Georgia's three 'sanctuary cities': Clarkston, Decatur, and Athens. The term sanctuary cities is not in official government parlance, but refers to cities where local government organisations do not actively enforce federal deportation policies. Republican candidate for Georgia governor Michael Williams revealed a ?deportation bus? as part of his campaign, in a video posted on Facebook on May 15. On May 20, Williams tried to make a campaign stop at Forsyth Park in Savannah but was greeted by approximately 50 protesters who surrounded the bus, preventing it from moving.